Does the White Fright live up to its billing? 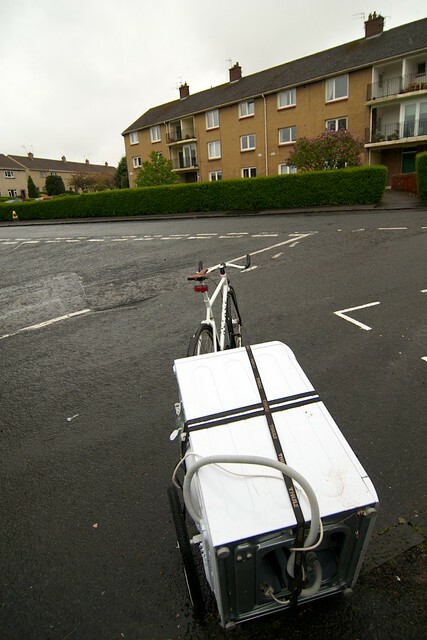 I ordered up the parts for a new utility bike – the White Fright – in October 2011. 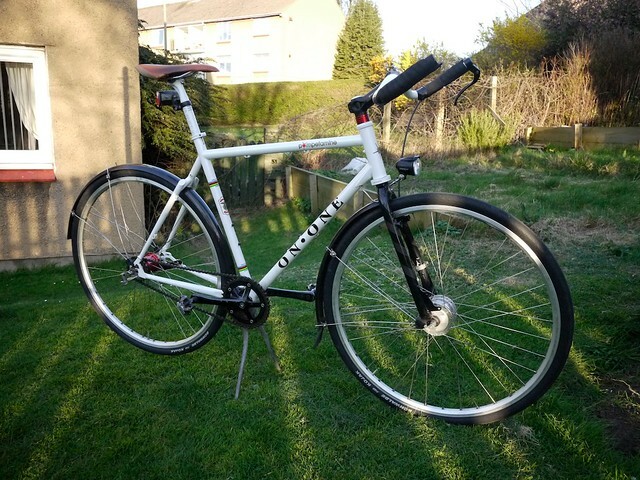 Special dispensation from my dear wife having been duly obtained, I set forth to make what I hoped would become the most effective urban commuting weapon the cunning of man could devise… all at a canny Scots’ price, you understand! The Maintenance Free Commuter Bike Project was born… I’ll detail it one day in a separate post, but the key is the awesome Sturmey Archer X-FDD front drum brake / dynamo and the rear SRAM Automatix hub gear. I’m finally posting this as the White Fright is now well over a year old and halfway through its second winter. I estimate the mileage to be a little under 3,500 miles. 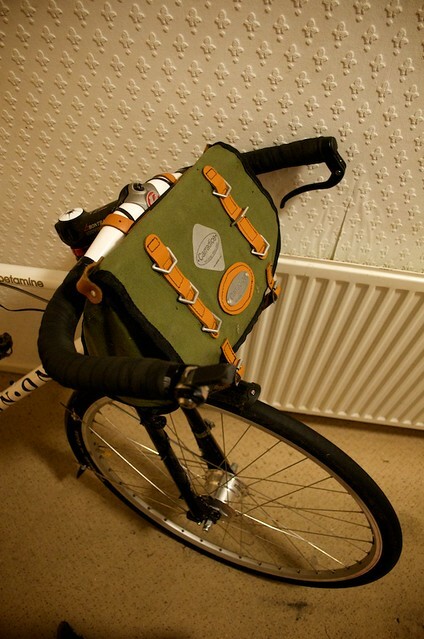 Front flat, spring ’12 – not even commuting! As the faulty hubs were all refunded and I build my own wheels, the long saga of Sturmey Archer didn’t cost anything (except my precious spare time!). I spent £28.18 on the original tyres and chain, and I’ve since fitted a new chain (at a cost of about £4 – mainly because the larger sprocket needed slack), while the Kojaks are showing their miles and are likely to be decommissioned (as I recently found some half-price replacements). In total I spent £650.91 on the rest of the White Fright parts (this includes all delivery costs and labour charges for the couple of jobs I had the LBS do). I did reuse some parts, such as saddle and lights. I can’t see the bike falling apart any time soon (the wheels are still tight and true) but let’s be ultra pessimistic and assume a tiny three year lifespan – that’s still an annualised cost of just £217, or a saving of at least £350pa vs the car. … I haven’t had to spend a significant amount of time or money on the White Fright in the last 15 months – and I haven’t had any trouble getting to work on time either! Bearing in mind that I have to pay 40% in various taxes to earn that £350 the car would cost, this bike is effectively a nice pay rise of £580 (or assuming it lasts a more realistic 10 years, a rise of £750+) just for the pleasure of saving time and staying ripped! project is how I found your blog. would you suggest the XL-FDD instead? The X-FDD is sufficient for me – even when towing a heavy trailer. I guess I took a bit of a gamble initially that the smaller hub would do the job, but I can’t say I would change my mind if I had to buy again. Maybe for a tandem or a full time cargo bike, or if I had to descend for many miles on steep 10%+ gradients I’d reconsider. For around and about hilly Edinburgh though, the X-FDD is just fine. Two good solid hubs. Let me know how you get on! OK, will do. Is there any reason, BTW, that you laced both wheels x2 rather than x3? Is it because of the large flange diameter? Yes, it seemed a bit more comfortable that way. They are both still running true after two years, so I guess this is also sufficient (especially combined with the wider tyres). I’m wondering about your Pompetanime frame — you appear to happily ride wide tyres (more than 35mm) on it, even though On-One officially says that clearance is sufficient for up to 35mm. How far do you think it will go? The X-FDD is trued, the A2 is laced, truing that one is next. 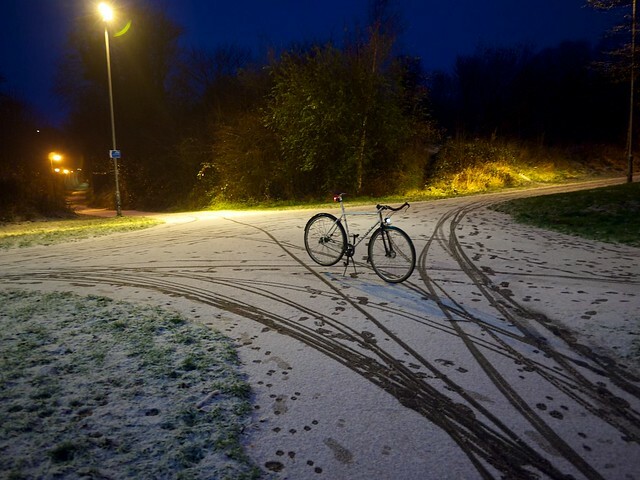 Matters are getting more urgent as I’ve just discovered that (1) it’s now dark-ish when I ride to work, and (2) the dynamo slips heavily and the front light is broken on my current commuter, rendering it rather dark and unsafe. At the moment I’m riding a 38mm Marathon Plus at the rear, with full SKS mudguards (I forget the size code; they’re the ones for 38-45mm 700c tyres). My fork is not from On-One but Cotic’s Roadhog (click here and scroll down) – I ordered one directly. It comfortably takes the big 40mm+ studded Marathon Winter, with a full SKS guard. I’m not sure about the On-One fork of course. I finally finished the build yesterday, a few minutes later it had accomplished its maiden commute. In the end, I decided to reuse an old steel frame of 30 years that I had re-painted a month ago, and I put mostly new components on it, mainly, of course, the X-FDD and the A2 (free-wheel) with a Shimano roller brake. Certain things about the old frame (other than the OLD, which was wrong at both ends, even without the A2’s spacers) forced me to improvise, such as the slots on the front dropouts (8mm instead of the X-FDD’s 9mm axle), the attachment for mudguards and the carrier, etc. But now everything is in place and the ride is, simply put, fantastic. I ride a 33/19t combination, and I find the shift point to be just slightly low, but not too bad at all. I’m sure it would be more of a pain with the higher gear ratio that you have. Another thing to get used to are the brakes, having used rim brakes exclusively for the past 12 years or so. The X-FDD and the IM-BR81 behave very similarly (with Sturmey-Archer levers), they start very smoothly but then grip hard as you increase force on the levers, the exact opposite of the dual-pivots on my racer. Part of the reason I went with the old frame (apart from not having to throw away a perfectly good Dutch-style assembly of tubes and lugs) is the insane radial clearance on both tyres that this frame has (for a reason I’m wondering about myself). Sideways clearance isn’t quite as generous, so I carefully checked the maximum tyres size I can fit, and went for the Schwalbe Big Ben 50×622, with SKS Bluemels B53 guards. Both are a perfect fit, and function really well so far. The one thing I’m wondering about is a slight “grinding” noise from the A2 when I coast or back-pedal. Do you reckon it would be a good idea to lubricate it somewhat, maybe the factory-supplied grease is a bit on the sparse side? Thanks again for reviewing the hubs and helping me make up my mind about them.